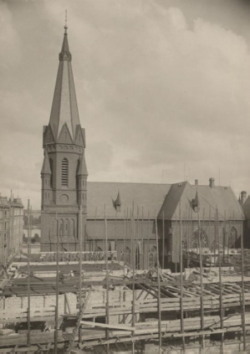 Sacred Heart Church was drawn in neo-Gothic style by architect and Jesuit Brother Friedrich Wipfler, who had worked at the cathedral in Cologne, and the foundation stone to the church was laid on April 8. 1893. In November 3. 1895, the church was inaugurated by Bishop Von Euch, the first Catholic bishop in Denmark after the Reformation. The church served as the Church of the Jesuits, which had and still has priest homes at the church. In 1941, it was decided to establish Sacred Heart Parish and the church made as the parish church. In 1972, the church was revamped after inspiration from 2. Vatikanerkoncil. The main altar and the two side altars were taken down and the new altar was moved into the chapel, so the priest had fronts against the parish throughout the mass. 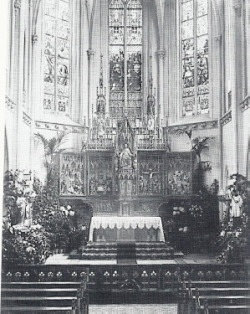 A sacrament chapel was arranged on the right side of the altar. The Maria statue was moved to its current location, where a historicerende reinterpretation of the old Maria Altar has since been restored. Read more about the rebuilding On this link. The three bells of the church were inaugurated on November 15. 1896. They are destined to ring on the notes D, F and G, which are the beginning of the song ‘ Te Deum ‘. They weigh respectively 1650, 968 and 703 kg. Click to hear all three bells in operation. The organ was built by G. Stahlhut in Aachen in 1899. Now it has 31 voices and over 1300 pipes spread over 3 manuals and pedal. The baptismal font is done by the sculptor Aksel Theilmann in Bornholm granite. The Ignatius statue was created by sculptor Jørgen Windfeldt-Schmidt as a body-sized gilded shape. The glass paintings in the church are created by Karl Herte and manufactured in Düsseldorf. The 14 images of the cross-road were painted in the Netherlands and hung in 1897. After the church’s modernization, they are arranged in transepts. 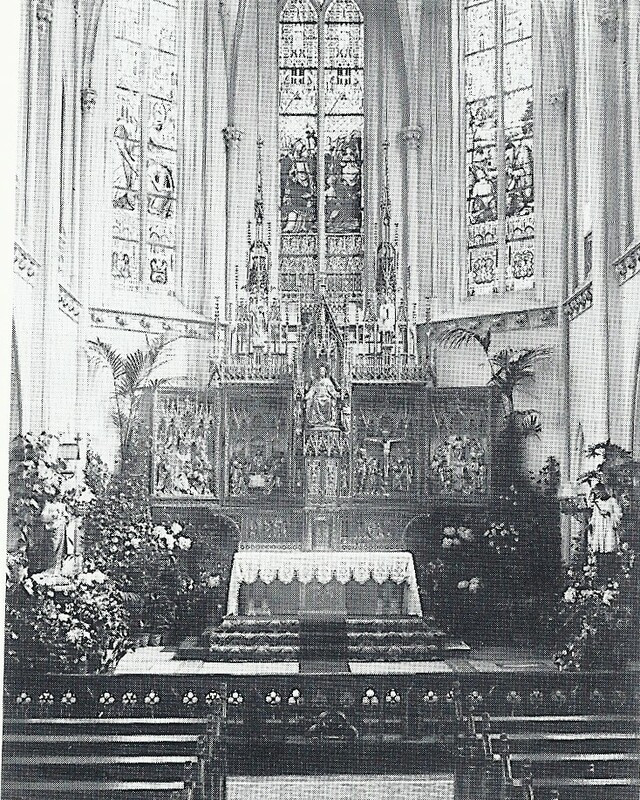 Here is a picture of the old décor of East with the original altarpiece. In the center console you saw the tabernacle where the consecrated Ciborias were kept. On the gilded door grapes and wheats were sown, symbols of the sacrificial gifts. Above was the place where the Monstrans with the consecrated Ciboria was placed to be worshipped. Usually the place was closed with two wing doors that were decorated with angels. After the conversion, the Tabernacle was placed in a sacrament chapel near the high choir. Today this is where the original tabernacle is placed, which is decorated with two wing doors, that hid the altar Monstrans. Via this link you find a list of the different elements that the present altarpiece still consists of.